Australia's Richie Porte of BMC romped to victory over a 23.5km individual time trial at the Critérium du Dauphiné. Bourgoin-Jallieu, France (AFP) — Australia’s Richie Porte made a Tour de France statement as he romped to victory in Wednesday’s 23.5km time trial at the Critérium du Dauphiné. Overall favorite Chris Froome struggled home in eighth behind the BMC rider. BMC’s Porte put in a stunning performance to beat four-time world time trial champion Tony Martin (Katusha-Alpecin) of Germany into second and leave fellow overall contenders trailing in his wake. 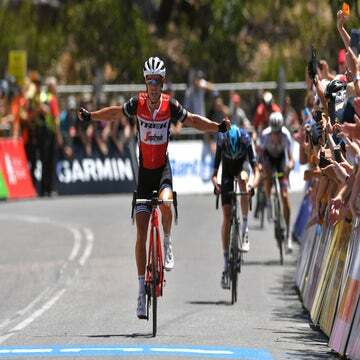 “I didn’t expect to either win the stage or take that much time,” Porte said after the race. “It’s been a long time since I’ve done a good time trial, so to do what I did today makes me really happy. 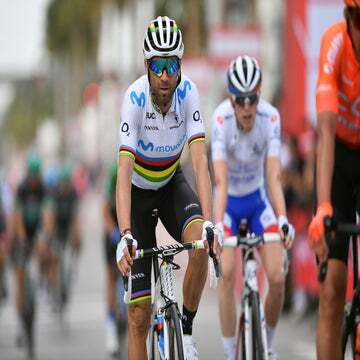 Belgian racer Thomas De Gendt of Lotto-Soudal held onto the overall leader’s yellow jersey after the fourth stage, 27 seconds ahead of Porte and 51 ahead of third-placed Alejandro Valverde. Spain’s Alberto Contador (Trek-Segafredo) is at 1:02, and Sky leader Chris Froome is a further 2 seconds adrift of the pace on the eight-stage race which is seen as a form indicator for the Tour de France. Reigning champion Froome had said on Tuesday that the time-trial would be “an important milestone” in the eight-stage race, which is seen as a form indicator for July’s Tour de France. “We’ve got a very similar kind of prologue in Dusseldorf, and a similar time trial in Marseille at the end of the Tour. It’s good practice and a good hit out ahead of that,” Froome had said. Veteran Contador was satisfied with his race, but said he can still improve. “I felt good, but I still have a margin for improvement to be totally comfortable in the time trial,” he said. Froome had predicted Porte would do well before the stage began. “I think that Richie is in great form,” he said on Wednesday morning. Porte flew round the course at an average speed of more than 50kph, finishing 12 seconds faster than Martin and 24 seconds ahead of in-form Spanish veteran Valverde. Thursday’s stage looks to be one for the sprinters before the race heads to the mountains and culminates with two summit finishes at Alpe d’Huez and Plateau de Solaison, where Froome and Contador are expected to lock horns with Porte.